Can you believe we are 1 week away from Christmas?! It's crazy that it's almost here. I am waiting on a few things to be delivered and then I just need to wrap everything. Today is also our Anniversary! 18 years of marriage. So hard to believe...time has gone so fast! I saw this sequin tank online and loved it!! Of course it's perfect for the Holiday season, but I also wanted to make sure it was one I could wear all Winter too. 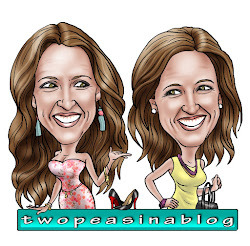 For both a casual style and a dressy style. So when I got it in the mail, I decided to try it a few different ways. The tank does run big. For reference, I'm wearing an XS. I love the looser fit and the longer length though. The color is a mix between gold and taupe. It's a great neutral that seems to pair well with any color scheme. The first look is how I styled the tank on our Instagram story (if you want to go watch it, it's saved in our favorites). I adore it with the leggings, cardi and OTK boots. 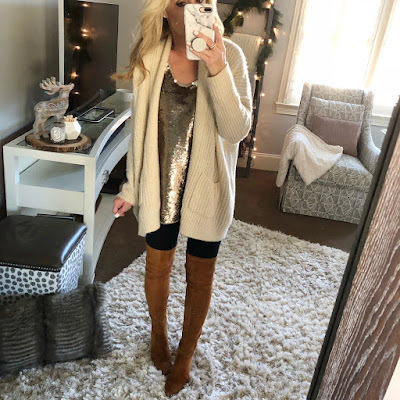 It's a very cozy look and the cardigan helps to tone down the sequins. These OTK boots are my favorite. They just seem to fit perfectly on my legs and stay in place and they have a small zipper in the back which makes them easy to get on and off. They are currently 30% off!!! The boots also come in a pretty grey here. Awww, this second look. Another great option for during the day or out for a casual dinner. Again the sweater tones down the sequins, but it's so fun peaking out the bottom. 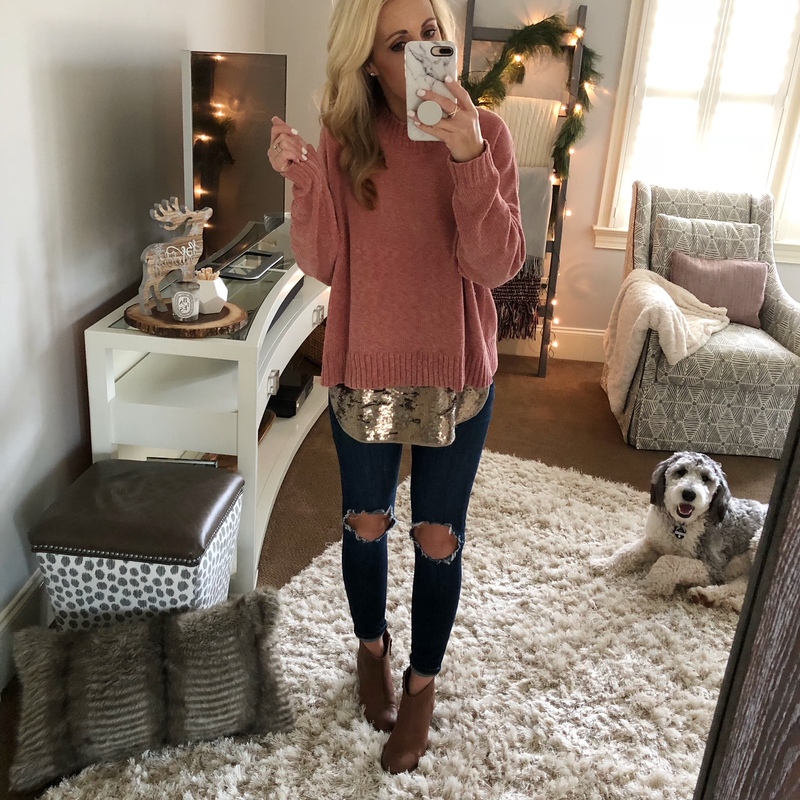 This chenille sweater is currently 40% off and comes in 2 other colors. Any sweater layered over top of the tank will work. How cute would a camo sweater or sweatshirt be? Or even stripes? This outfit is a more dramatic look. It's full on sequins!!! Skinny black jeans with ankle strap sandals are always a winning combo! And they look so chic with the tank. So this would be perfect for a holiday party, New Year's Eve or any night on the town. 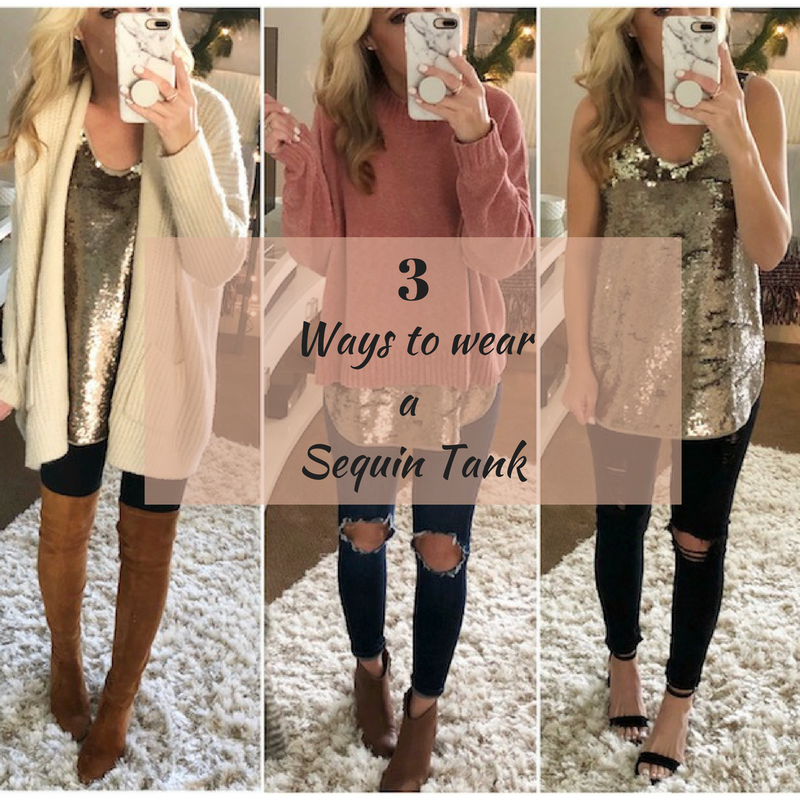 Because of all the sequins, you don't even need to add much jewelry.